Before reporting a bug or other issue make sure the latest version of SharpCap is being used as the bug could have been fixed already. Also, search the forums for other users reporting the same issue as there may already be a workaround available. Forums for reporting Bugs and Crashes and other discussions of SharpCap can be found at http://forums.sharpcap.co.uk . • A thread subject briefly describing the problem. • A description of what was trying to be done. • A list of the steps needed to make the bug happen. • The contents of the SharpCap log collected after the problem has occurred. Since the log text can be rather long, post it as an attachment rather than including it in the body of the post. While SharpCap is running, the log text can be obtained via File > Help > Show Log. Logs are also saved in the folder %LOCALAPPDATA%\SharpCap\logs. Alternatively, access the folder C:\Users\<user name>\AppData\Local\SharpCap\logs to find the log file after SharpCap has been closed. If SharpCap crashes, it is most likely a message will be displayed requesting a bug report to be submitted. If connected to the internet, press the Send and Quit button and the bug report will automatically be uploaded to the SharpCap bug archive. Optionally, add a description of what was taking place when the crash happened. If not connected to the internet, press the down arrow next to Send and Quit which shows extra options including sending the bug report by email and saving it as a file which can be shared on the forums. · Upload to S3 Bucket – the default action when pressing Send and Quit, report is uploaded to the internet. · Send via Email – when connected to internet. · Send report manually – the generated report will be saved as a zip file ready for manual submission to the forums. 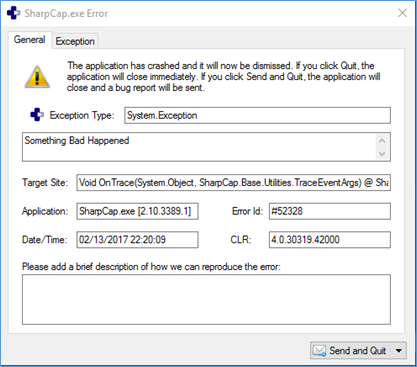 The bug report contains a description of the problem causing SharpCap to crash and the contents of the SharpCap log, both of which help track down the problem causing the crash. Once SharpCap has been run this way, try to make the crash happen again. If the crash happens, a file called SharpCap.dmp will be created on the desktop. Post on the forums including a link to the SharpCap.dmp file and a description of what was being done when the crash occurred. Dump files can be large, so provide a link to the upload – Dropbox, Google Drive and Microsoft’s One Drive are useful technologies here, there may be others.